A common myth works around people that mixing gold and silver jewelry is a strict no. Fashion is always what you make out of it. Therefore, it is quite flexible with the rules and you can always create a statement with your unique look. You would be pleasantly surprised to know how amazing it looks if you can create a combination of gold and silver in the right way. 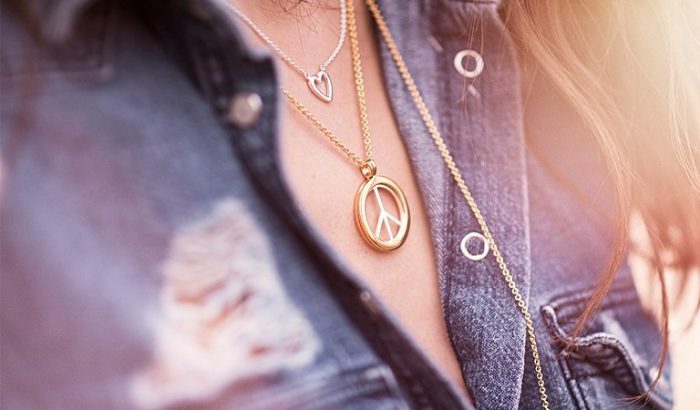 What jewelry you wear defines your personality or mood. Sometimes you want something bold and other times you want a simple and sleek style. Mixing gold and silver actually gives you the liberty to play with different styles and patterns and create an overall beautiful look. 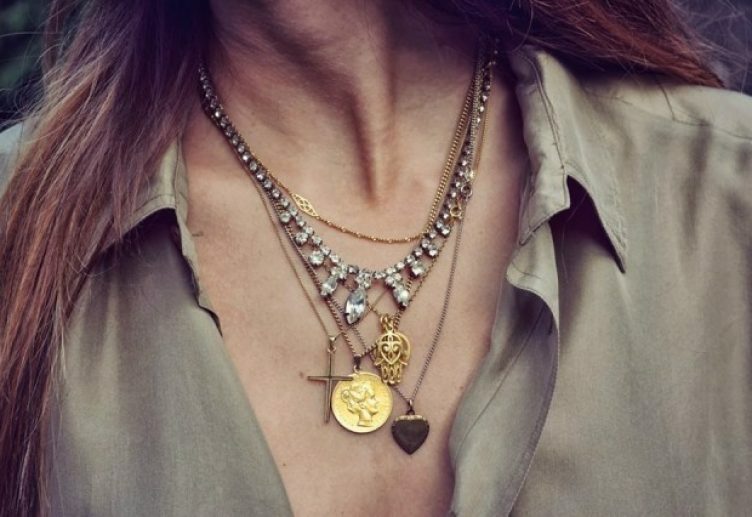 Another great reason to mix silver and gold together is the fact that you can always create a different look with similar jewelry pieces just with a different combination. This might be something new to you since even four to five years ago, mixing two different metal jewelries would be considered a ‘fashion disaster’. We have tried to provide a step by step guide on how to start the approach with your styling. 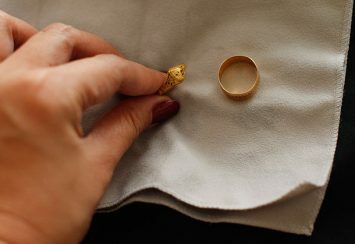 We understand for some people jewelries are always handpicked personalized items and how emotionally they are connected to them. 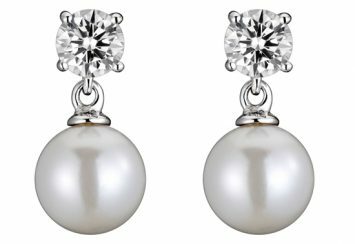 If you are one of those people who put in a lot of effort while selecting the right type of jewelry, you have come to right place! Here’s a step-by-step approach on how you can create a well-coordinated look with mix of gold and silvers. If you are into fashion trends or style, you know how important the right clothing can be. By that we don’t mean only branded or expensive clothes. How you carry it is what matters the most. You can even be the center of attraction by putting on a simple tucked in T-shirt even. Styling the cloth is more important than the category of clothes itself. 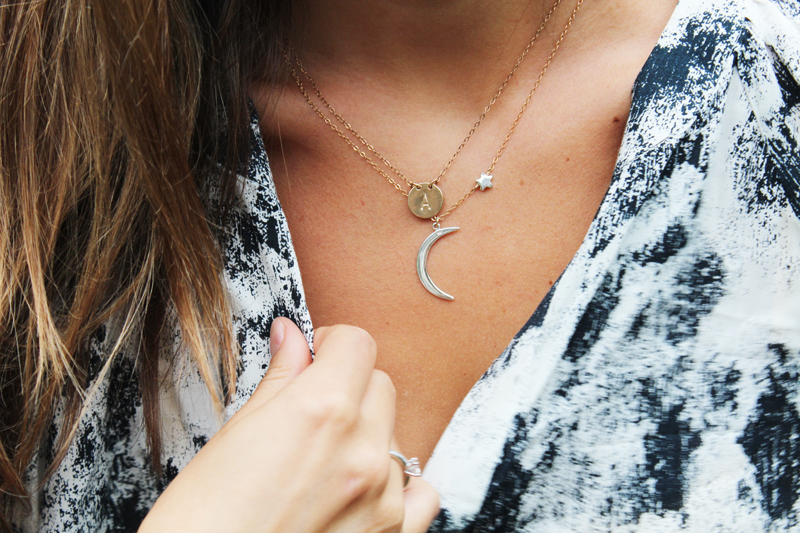 And one of the most important ways to style your outfit is through jewelry. The jewelry pieces that you are selecting should compliment your outfit. For example, with a summer outfit, you would want your jewelries to be small and with simplistic design preferable a monogram bracelet or neck piece. But for party attire, you can create a bold look with large rings made of your birthstone. The next step is to fix the pieces of jewelry. If you like wearing accessories, you would definitely know the wide variety of jewelry options that are available for each body part. To help you better organize we have categorized jewelry into few parts which are discussed below. Neckpieces: For neckpieces you have pendants, lockets, beaded necklace, traditional necklaces, chains and chokers mostly. The thumb rule is to use one specific type and then wear extra gold or silver chains. But you can always customize your own way, that’s the beauty about mixing jewelry. Rings: This is probably the most versatile of the category. You have earrings, toe rings, rings for fingers, nose rings, rings for eyebrows and belly buttons. Although you can only mix and match silver and gold with rings for finger and toes. However, for the overall look you also need to keep in mind about the nose rings and earrings. Foot accessories: If you are not wearing shoes or boots, foot accessories like anklets or toe rings are quite trendy nowadays. You can mix and match silver and gold keeping in contrast with your sandal or slipper’s color. Now step 1 and 2 here can be interchangeable. You can either decide on your outfit first and then fix your jewelries pieces or vice versa. We know you must love to wear multiple jewelry items in various body parts. However, always keep in mind to create a focus on one particular area only. What we mean is, you can definitely wear bracelets, rings, neckpieces all together but you need to create a separate statement for one particular area only. For instance, for a housewarming party, you can wear a gemstone necklace and add multiple silver and gold chains. In that case, your neck is the focus area. In other parts, go with some small jewelry such as bracelets or a watch. Another reason to create a focus area is to avoid overcrowding and overuse of jewelry. It is always best to only create a mix on one particular area only. The focus area can be your neck, wrist or ears. This is the most important factor when you are new at mixing silver and gold jewelry. It will help you design the pattern better. There are definitely separate ways other than going for a bridging piece but we would recommend doing that once you fully accustomed to gold and silver mixing. The bridging piece can be an antique watch for the wrist or a timeless jewelry. For the neck, you can go for a heart-shaped gold or silver pendant as the bridging piece with multi-layered chains. You can even create a bridging piece with your finger rings. Wear a large ring in the index finger or ring finger and wear smaller ones in other fingers. Now the great part about mixing is that same jewelry items can help to create a different look. For instance, if you have only ten pieces of jewelry, you can try out hundred mixing and matching styles with those ten jewelries only. Amazing, right? Another important tip from us: whatever you wear, wear that confidently. Carry yourself confidently and trust us, any style or look will suit you. Creating the right mix is quite subjective. There are no fixed rules to follow here. The mixing style will vary depending on the occasion or the type of attire you want. We have come with few ideas on how you can mix the jewelries based on various occasions or looks. For everyday office or college, you would want something simple and comfortable. Our personal favorite style for the simple look is to wear a big dialed silver watch along with two thin golden bangles. The combination is smooth, easy and stylish at the same time. 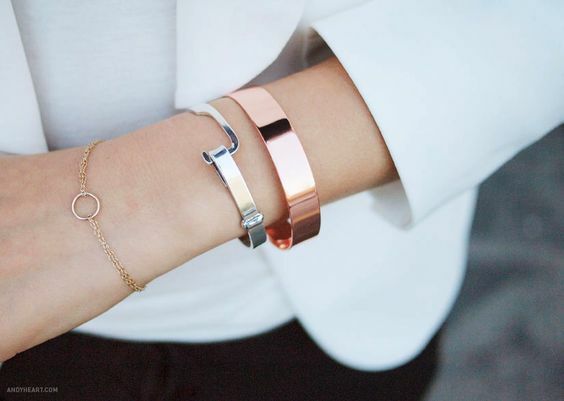 Another easy and simple look for the wrist can be alternate bracelets of silver and gold. For the neck however, a simple silver locket along with a gold chain should be enough. The traditional pattern styles are the best part about mixing silver with gold. Charm bracelets are the most popular piece of jewelry when it comes to traditional look for the wrist. Sterling silver charm bracelets with large gold cuff bracelet in the middle is one of our favorite traditional looks for the wrist. For the neck, you can wear a beautiful gold plated collar necklace or choker paired with some silver multi-stringed neckpiece. This is what we term as an absolute breath-taking or gorgeous look. Although if you are going for heavy jewelries, we would recommend not to overdo with the outfit otherwise, your jewelry will not stand out. For online or business meetings, semi-formal styles are quite popular. We would recommend in these cases to focus on the hands more rather than the neck. Your hand movements while giving a presentation will look better compared to the neckpieces. Vintage or antique gold bracelet with pearl in the middle can be your bridging jewelry. 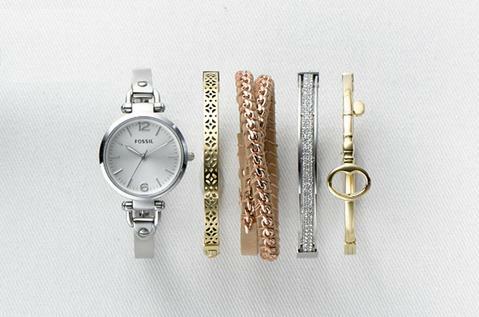 Add some silver cuffed bracelets with those and you have yourself the perfect jewelry mix for your semi-formal look. A multi-strand golden bracelet with paired with two single silver bracelets are also a good combination for your semi-formal attire. You can also go with a large gem stone ring on the fingers and a slim silver watch for a semi-formal look. For casual styles even if you know how you can improvise your everyday look. To make things convenient for you, we would recommend that you keep two separate jewelry boxes for your casual and formal wears. This will make things simple for you to organize. For casual wear, you can use a large silver watch as the bridging piece and mix them with alternate beaded gold and silver bracelets. You can also simply wear a gold ring in the index finger and a silver ring in the ring finger and a sleek silver cuffed bracelet on the wrist. For the neck, focus area you can use a silver opera necklace paired with some long golden chains. For black tie events, you need to be strict about the formal attire and we understand that. Don’t worry mix of silver and gold is so versatile that we have few ideas for your formal look as well. For the neck you can go for a golden bib necklace paired with a thin silver choker. For the hands, simply an alternate combination of golden and silver cuffed bracelets will look classy and elegant. You can wear a silver watch and a golden ring on the other hand to create a complete formal look. Alternate gold and silver chains on the neck can also look great if you are wearing a black suit with white shirt. For your festive look, you have the liberty to go ‘extra’ with your jewelry. For Christmas, thanksgiving or Easter, gold and silver mix jewelries can create a unique fashion statement for you. For the wrist, use a gold watch and adorn the rest of it with cuffed bracelets, bangles and pearl bracelets in the form of alternate gold and silver colors. Or you can simply wear a large golden bracelet on both hands and wear two small silver rings on your thumb and middle finger. Retro styles are something that you usually do not do on a regular basis. Maybe for themed parties or gala nights, you might have to manage a retro look. Luckily for you we have few ideas on the retro style as well with the existing jewelry you have. Simply three to four gold and silver alternate cuffed bracelets can create a great retro look for you. An even interesting approach could be to wear rings on alternate fingers with mix of silver and gold. For retro adding few more colors with gold silver combination is a good way to go. Now that you understand different category of styles, we have made a few pointers for you on the basis of special events. During special events, we know that you probably trial and error plenty of outfit choices. The same problem prevails for jewelry lovers too. So, for those special events, we have jotted down some unique styles. Surprise your date by wearing an engraved silver bracelet with your partner’s initials. Add few gold bangles with them to create a complete look. You can also choose to wear a silver locket with heart pendant or your partner’s favorite gemstone along with a golden antique choker. For something ornate, you can wear a plastron necklace with silver base and golden beads. A single jewelry with a mix of silver and gold is a unique style to follow. For a girl’s hangout, we know you would love to show-off your collection of jewelry. If you are wearing a fancy top, we recommend that you keep it classy through a branded gold watch paired with two to three charm bracelets. You can also wear a silver matinee paired with multi-stranded golden chains. For gala nights or big parties, we know you want to look your best. In these events, most of the times you like to play it safe. That is, you get over-conscious while choosing your outfit or jewelry. The safest choice would be to go for a golden lariat neckpiece along with silver choker. If you are confident about your appearance, you can also go for a mix of golden and silver opera neckpieces. Add some fancy rings on the ring finger and thumbs with a combination of gold and silver and you have yourself a unique look. For your birthday dinner, when all the attention is on you, it is completely okay to become over-cautious about your appearance. On your special day, look absolutely fabulous with a combination of golden princess necklace along with silver operas. For the wrists you can choose turquoise bracelet in the middle with two to three golden and silver bracelets on both corners. While mixing any type of jewelry, always keep a few things in mind. Sometimes a random combination gathers a lot of appreciation whereas sometimes you can never get your desired look no matter how hard you try. It’s okay to feel that way and hence some extra tips from our side just for you. The general thumbs rule in standing out among the crowd is to go for an exotic piece of jewelry. It can be anything! It can be a small diamond cut bracelet or a uniquely shaped bangle. We recommend that you keep at least two to three exotic jewelry pieces in your collection. If you are going on an ornate event or any other special event, always choose antiques over other options. Antiques always gather more attraction compared to a normal piece of jewelry. Remember, we mentioned that you keep casual and special jewelries separately? Here’s where it gets handy. To lift up your mood, pair your everyday jewelry with one special jewelry that you own and you will see how pleasantly surprised your co-workers or classmates will become. The final tip would be to wear meaningful stones once in a while. Precious stones not only hold beautiful meanings but look absolutely stunning on any jewelry piece. Emerald, amethyst, sapphire and topaz are our top favorite choices for precious stones that go well with silver and gold combination. We tried to be comprehensive while making you aware how to mix silver and gold in the right way. Once you get the hang of it, you would absolutely love to play with this combination for all types of styles ranging from casual wear to strict formals. Just remember not to overdo with multiple jewelries and don’t be extra cautious in public while trying out a new style. Just be confident!